The Sarratt Student Center is named for Charles Madison Sarratt (1888-1978), whose bust (and personal “mission statement”) decorate the original main entrance. Sarratt had a storied 62-year career, during which he taught mathematics, served as Dean of Students, Vice-Chancellor Emeritus, Dean of Alumni and (for four brief months in 1945), Chancellor Pro Tempore. Sarratt Student Center reflects the product of four distinct phases of construction. Rand Dining Hall was built in 1952, its location central to Vanderbilt Campus. In 1974, Sarratt was erected in the form of two buildings — the cinema/art gallery, and the Glove Lounge/Overcup Oak — joined by an elevated walkway, under which students could pass to reach Rand. The dining hall and bookstore were rebuilt and expanded in 1986 at a cost of $6 million. In 2000, the 56,000-square-foot Sarratt complex received an 18,000-square-foot expansion in the form of the enclosed Promenade and the 3rd floor Skylight. Student complaints of Sarratt’s being confusingly arranged, poorly lit and visually unnerving were addressed by joining the 3 separate Rand/Sarratt buildings into the single large structure of today. Students have 24/7 card access during all other hours. 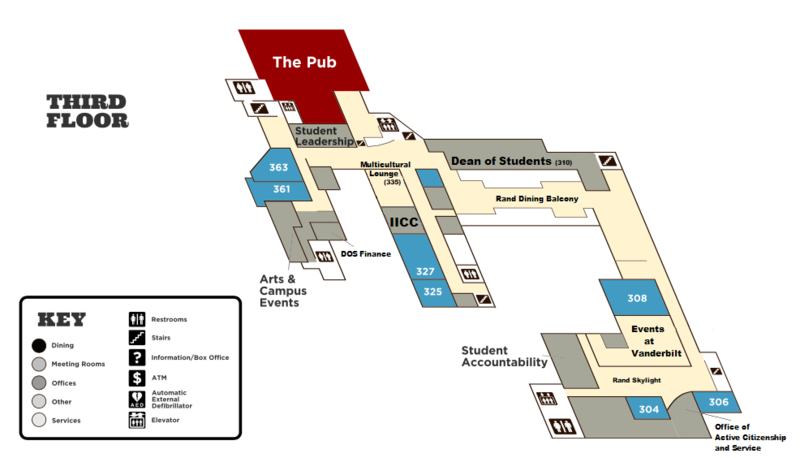 The Pub has been a staple of the Sarratt Student Center experience since it opened in 1974. The Pub caters to those looking for true pub fare–burgers, fries, chicken fingers, and more. As a campus rite of passage, students celebrate their 21st birthdays with an adult beverage – The Pub being the only spot at Vanderbilt to offer this service. It’s a good place de-stress at the end of a school week. 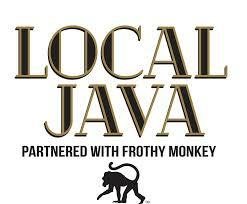 Local Java, a coffee shop opened in 2017, is partnered with Frothy Monkey Roasting Co to offer breakfast, lunch, and the beverage of your choice. Check out their breakfast biscuits, chai lattes, or seasonal coffee drinks. Seat yourself at the lounge located directly outside to enjoy your drinks and food. 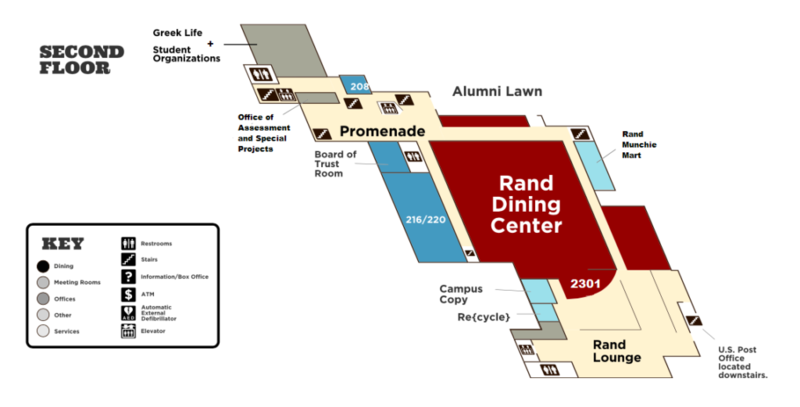 Rand Dining Center provides students, faculty, and staff an opportunity to eat and interact. Rand Dining offers a variety of foods such as the infamous Rand Cookie, build-your own grain bowls, and a Tex-Mex station. Befriend the dining workers to solidify a true Vandy family experience. Looking to attend a student event on campus? 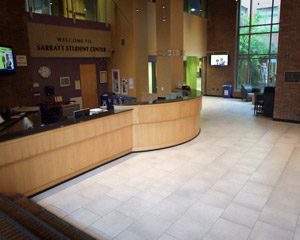 The Sarratt Box Office is located on the first floor directly outside of the Sarratt Cinema. In addition to in-person sales, event tickets may also be purchased online through its distributor, Ticketweb. Discounts are available for the VU community, including RTA bus/train service and Regal Theatres movie vouchers. Its student workers pride themselves on stellar Sarratt | Rand event support, wonderful small talk, and providing both great directions and insight to out of town visitors. Rand Munchie Mart features grab-and-go lunch and snack options. With a balance between traditional on-the-run snacks and the fresh nutritional options such as sandwiches, salads, yogurt, fresh fruit, bottled smoothies; the Munchie Mart offers a nutritional version of fast food. Since Sarratt opened its doors in 1974, the Baseball Glove Lounge has played host to its namesake–a replica of the famous Joe Chair. Italian designers de Pas, D’Urbino, Lomazzi created the Joe Chair (named for Joe DiMaggio) in 1970. It gained fame when this modern piece of furniture was exhibited at MoMa in 1972. So stop by and be part of Vanderbilt’s little piece of modern art history. The Baseball Glove Lounge is one of the most popular quiet study spaces on campus. Located between Rand Dining hall and the Sarratt Student Center, the Baseball Glove Lounge is a great place to settle down with food, gaze out at the beautiful views of Alumni Lawn, and make good use of your textbooks in this cozy nook. 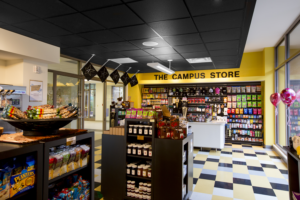 The 3U Games Room opened in the summer of 2009 after Vanderbilt Student Government and Sarratt Student Center collaborated to liven up the space. Surrounded by “Dores” of the past, students venture to 3U to relax over a game of pool or fooseball. All equipment needed for a game of 9-ball or a quick fooseball match are located right there. Just steps away from The Pub the 3U Games Room offers an elevated pool hall feel. Since 1975 Sarratt Art Studios has been the best-kept secret on Vanderbilt University’s campus. Ten-week non-credit classes are open to Vanderbilt students, faculty/staff and the Nashville community. We offer a variety of the classes in photography, pottery, jewelry, drawing, painting, book arts, printmaking, fused glass and more. All classes are taught by some of the finest Nashville artists at very affordable prices. 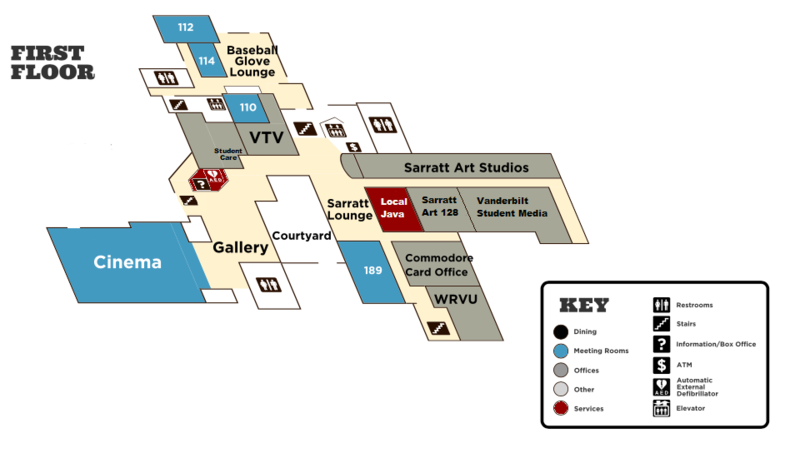 The Sarratt Gallery showcases artists from all over the country as well as from Vanderbilt. Shows change each month, and include the popular Holiday Arts Festival, which features contemporary crafts by Tennessee artists. See the Gallery website for an exhibition calendar. The Gallery is located in the main lobby of the Sarratt Student Center. For additional information, call 322-2471. All events are open to the public free of charge. The Sarratt Lounge extends the coffee house feel outside the borders of Local Java. This comfy, funky place to hang out, socialize, or enjoy a beverage has become a new hit with the students and staff. The retro inspired furniture and bright colors embrace the building’s age and provide a modern twist. Vanderbilt Dance Program provides a curriculum of dance classes in all areas and levels of expertise. The program offers classes in Ballet, Tap, Jazz, Modern, Hip-Hop, Pas de Deux, Pointe, Irish, Contact Improvisation, Choreography, Bharatanatyam (classical dance of India), Belly Dance, Ballroom, Swing, Salsa and Latin plus Pilates and Yoga. Instructors are extremely experienced and encourage students to reach their highest potential. Each class presents opportunities for students to experience the physical benefits of dance education, as well as provides opportunities to enhance artistic, intellectual and creative growth. In addition, the dance program hosts master classes, workshops and residencies with local and national dance professionals. Vanderbilt Student Communications, Inc. exists to provide the students and other members of the Vanderbilt community specific services and outcomes, primarily, (1) the provision of an environment that fosters the development of students’ skills in leadership, management, human relations, and fiscal responsibility in a unique cocurricular setting that allows for high levels of participation in daily-run, product-oriented organizations; (2) the provision of realistic opportunities for students to learn and gain competency in specialized mass communications skills ranging from writing, editing, computer-aided design and production, advertising creation, sales and accounting, to television and radio production, program conception, and on-air participation; and (3) the provision to the campus community of print and broadcast media serving as forums for free expression, allowing the exchange of ideas, dissemination of news, outlets for creative work, and vehicles for entertainment, fulfilling a role critically essential to the health of a vibrant university in a democratic society. The Office of Greek Life is a team of caring and committed advocates for the fraternity and sorority experience who challenges students to uphold the values espoused by their organizations in order to remain relevant to the mission of Vanderbilt University and the Office of the Dean of Students. We provide education and support that adds value to students’ holistic collegiate experience, thus producing well-rounded citizens of a global society. We achieve these ends through intentional partnerships with campus departments, community agencies, and international fraternity and sorority staff and alumni volunteers. The Office of Student Organizations strives to encourage co-curricular learning and personal development through intentional student engagement. Student Organizations connects the campus community by highlighting opportunities for meaningful involvement and providing tools to help manage and track the co-curricular student experience. We support the mission-driven work of student organizations and seek to equip student leaders with vital skills and resources in order to make their organizations more effective, inclusive, impactful, and sustainable. The Office of Student Accountability, Community Standards, & Academic Integrity promotes good citizenship within the Vanderbilt University community through education. Students are expected to respect themselves and others, to act responsibly, and to be accountable for their actions. The student accountability system addresses student violations of University policy through fair, consistent, and confidential procedures. Welcome to the Office of Inclusion Initiatives and Cultural Competence. The mission of the IICC is to promote an environment of cultural competency, inclusivity, and awareness on the Vanderbilt campus. We accomplish this through the creation of intentional programming initiatives and trainings for students, faculty, and staff that promote social justice, an ability to instigate and participate in constructive conversations surrounding difference, and holistic identity development. We provide structured support to our multicultural, international student scholars, as well as students with disabilities, and foster intentional partnerships with relevant offices on campus. Through our efforts, we are helping to move Vanderbilt forward as an institution dedicated to all forms of racial, cultural, gender, religious, and sexual identity expression and equipping our students with the tools they need to effect change in an increasingly diverse world. The Office of Student Leadership Development (OSLD) at Vanderbilt would like to extend a warm welcome. Our office is dedicated to fostering leadership development for all students who desire to engage in lifelong learning. We encourage you to stop by our office in Sarratt 339 and get to know us. Whether you want to meet to have a conversation about leadership theory, personal development, your path to success or simply have a conversation about your day, we welcome you with open arms. The mission of the Office of Active Citizenship and Service (OACS) is to create a culture for exploration and learning followed by critical reflection and action for the common good. OACS empowers students and their service organizations to become involved in the community through volunteerism, issue awareness, education, advocacy, and activism. OACS offers a growing number of experiential learning opportunities locally, nationally, and globally. We encourage and support students to become more engaged in the community through active citizenship. The Office of Arts & Campus Events (ACE) includes the major arts and campus programming initiatives on Vanderbilt’s campus: Vanderbilt Programming Board, Transfer Orientation, International Lens Film Series, Rhythm & Roots Performance Company, Sarratt Art Studios, Sarratt Youth Art Institute, Vanderbilt Dance Program, and the Vanderbilt Performing Arts Council. 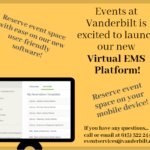 The Office of Arts & Campus Event’s mission is to facilitate and promote diverse programming for the Vanderbilt and Nashville Community that cultivates social engagement, cultural enrichment, artistic exploration and intellectual growth.